This the true story of a few teenagers who are used to playing video games on their computers. These guys are able to convert that experience, along with their knowledge of how to get the most out of the internet into a ton of cash. This is a story of what they did, not a “How to Win at Online Poker” book. The book is about their lives as they found out that they could win a lot of money playing Texas Hold’em on the various online poker web sites. They got together in online forums and discovered that other guys were doing the same. They discussed winning and losing strategies in these forums. They made even more money. This is their story of over the top wins and jaw dropping losses. Most of these guys were barely out of high school and were pulling in thousands of dollars a week, so they were going nuts with their instant riches. They were living like rock stars. This is also the story of how they moved from a loose knit group of online gamblers to the real world of poker. How they played in the big poker tournaments that were being broadcast on cable in 2004 – 8. How some of them hit bottom and how some of them are still winning today. I really enjoyed reading this book. I can relate to these guys, even though I never played online poker. I have played Texas hold’em with friends, but I don’t consider myself a gambler. I do use a computer, have played some computer games, and have been on a few forums and discussion boards, so all of the concepts in this book feel quite real and possible. I give this book a big double thumbs up and 5 stars out of 5. This is more of a guy’s book, there is a lot of drinking, going to strip clubs, and way over the top party descriptions, that may be offensive to many people. It is now illegal to play online poker for real money in the United States, but many countries still allow it. Jonathan Grotenstein is a reasonably successful author and ghost-writer (read: working), less-than-successful screenwriter, and recovering professional poker player. After spending much of the ’90s on an Internet thrill ride, Grotenstein realized he could make a far more honest living at the poker table, where there’s no need to suspect that everyone is lying to make a buck. (They are.) He succeeded more than he failed, but quickly discovered that he could achieve significantly more consistent results as a poker-playing writer than a writing poker player. In 2004, he and Phil Gordon co-authored “Poker: The Real Deal,” which became, thanks to a lack of any serious competition at the time, one of the best-selling poker books in history. Grotenstein collaborated with Gordon on two sequels, ghost-wrote “Online Ace” for poker pro Scott Fischman, then teamed up with Storms Reback to write “All In: The (Almost) Entirely True History of the World Series of Poker.” He contributed (and, in some cases, donated) dozens of articles to the poker magazine “All In” and primers on poker and blackjack for the Lonely Planet’s guide to Las Vegas. Grotenstein resides in Pasadena with his wife and two sons, where, when he’s not toiling away at his crappy novel, he continues to ghost-write for TV stars, NFL veterans, celebrity dog trainers, and the occasional fictional character. 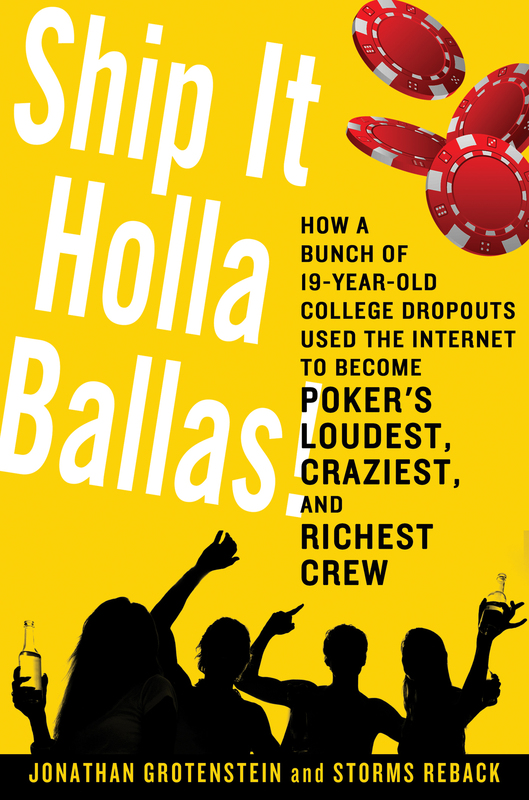 His current project, “Ship It Holla Balla!” — the true story of a group of teenagers who made ridiculous money and even more ridiculous life-decisions during the late ’00s online poker boom — will be published by St. Martin’s Press in 2012. His current project, “Ship It Holla Ballas!” — the true story of a group of online poker players who, during the late ’00s Poker Boom, made ridiculous money (and even more ridiculous life decisions) before they were even old enough to drink — will be published by St. Martin’s Press in 2013. The product descriptions and author information is from Amazon. Ship It Holla Ballas!